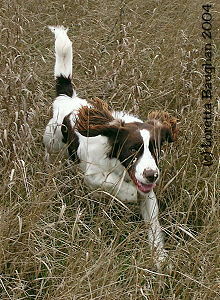 Hunting cornfields, sloughs and hedgerows - that’s what a springer does best. However, most of our training involves working the young dogs in a grass field. Training the control into a dog does not start in those typical pheasant covers. When training for control, you want to have all of the variables in your favor. Training in a grass field allows you visual contact at all times and, if needed, a long lead can be attached to the dog for more control. The grasses in our Pine Shadows training fields are: switch grass, Indian grass, and a mixture of brome, timothy or clover. Our fields are planted to produce cover that is conductive to the training stage of the dog. As training progresses, obstacles can be added. The puppy field is a mixture of short grasses - predominately timothy and June grass. These varieties only grow 12" to 15" tall and turn brown quickly by mid-summer. It is ideal for young dogs to have some cover in which to hide the birds, yet is short enough so the dog can see the handler. The field is dead enough in the heat of summer to produce a pup that can use his nose, find the birds and mark well. When the puppy field grows too tall, we strip the field with a mower to provide a path for the dogs to run. This also aids in scenting the birds and will not produce a point in the dog that can so easily happen in poor scenting and cover conditions. The control in a young dog starts in the field. All of the running around the pup does is set up to encourage him to go back and forth. The pup can see the handler and see him throw birds into the cover. When the dog gets close to where the bird went down, the light cover allows for a fairly easy find - with the use of his nose and eyes. Most of the sessions are conducted into a head wind which forces the dog to quarter. A dog with a good nose will naturally go perpendicular to the wind. 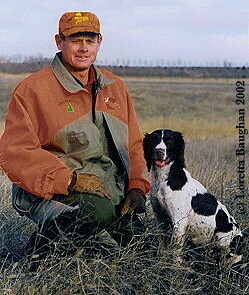 The natural ability to hunt back and forth in front of the handler is quite simple to bring out in a springer. Teaching the dog the correct figure-eight pattern starts right from the first quartering session. In the first few sessions, always walk into the wind. When walking with your pup in the field, carry a training dummy and encourage the pup to run to the right and to the left of you. Start with the pup sitting in front of - and facing - you . Cast the pup out and begin to walk in that direction. This will indicate to the pup that you want him to go in that direction. When he runs out and reaches the maximum distance you want him to hunt - usually 20 yards or so - the natural inclination of the pup will be to turn into the wind. The idea is to have him quarter side to side. When he reaches the maximum distance on one side, the pup should begin a gradual swing into the wind, making a small loop in his pattern while coming back towards you and casting off to the other side. Introducing two "toots" on the whistle at this time also keeps the pup in tune with your handling. Sometimes, a pup will start turning back away from the wind and make a loop behind you. If this becomes a pattern for the pup, it can be a major problem to correct. This turning back does not allow the dog to wind birds and find them as efficiently as the dog who turns correctly into the wind. This can cost you game in a hunt or a severe mark-down in a field trial. The first solution is to begin moving in the direction of the dog right after he begins his back cast and wave your arm in the direction you wish him to run. He should hear and see your commands and turn back in the right direction. If this seems to be working, continue to encourage the dog to turn out away from you and into the wind. "A dog with a good nose will naturally go perpendicular to the wind"
If that solution does not work - or if he becomes confused and wants to come back into you, seek help from an experienced dog person to roll clipped wing birds into the cover on the side that is the problem. The goal is to get birds tossed into the area upwind of the pup in order to draw the pup into turning upwind and finding the bird. This becomes a reward for the dog to turn upwind, find the bird and come back to you for praise. Again, make sure these sessions are into the wind and the scenting is good with adequate cover to encourage the dog to use his nose and not his eyes. Another solution we use is to cut strips in a grass field that look like a flat "U" - about 30 yards wide. Instead of grass strips cut straight across, we hook the ends upwind and then place the rolled in birds in that hooked end. This works for younger dogs as it helps in quartering, also. Sometimes all these solutions do not get the needed results - so running a downwind course comes into play. A change to a completely different wind direction may produce the results. Another possibility may be a change of birds - going from pigeons to guineas or even pheasants. Whatever the solution, a trainer needs to recognize the pattern problem first and get it corrected before it becomes ingrained in the dog’s head that it is OK to run big backwards loops.